After days of planning and hours of prepping, you finally shared the long-anticipated Thanksgiving meal with all your holiday guests. Now, don’t let all that hard work go to waste! Rather than using your leftovers to make your typical turkey sandwich, you can take a creative approach with these updated recipes. Making a one-of-a-kind breakfast or cozying up with a warm bowl of turkey chili will continue to impress any weekend guests and you’ll feel good knowing your leftovers were put to good use. Give your mashed potatoes a second chance by simply adding a few ingredients. Crispy on the outside and fluffy on the inside, these potato pancakes are easy to make and are a great way to revive leftover taters. Enjoy a festive breakfast even while on the run as you conquer your holiday shopping. Garnish with granola or chopped nuts for an extra punch of protein or have as a side for a bigger breakfast. This breakfast dish is an egg-ceptional way to use Thanksgiving leftovers! Throw a few extra ingredients into one skillet and you have a colorful and delicious meal. Add a little spice to your holiday weekend with these easy-to-make enchiladas! Packed with salsa verde and avocado, your taste buds will be thanking you with every bite. Tender leftover turkey and velvety pumpkin puree make this hearty dish a cozy fall treat. For a finishing touch, top each bowl with a dollop of sour cream and a sprinkle of green onions. The Thanksgiving feast doesn’t have to end! Layer your yummy leftovers in mason jars to give guests as they leave or treat yourself to an on-the-go meal that’s hearty and convenient. If you’re anything like us, you like your holidays on ice—as well as shaken, stirred and garnished with a seasonal treat. Now that we’re approaching Christmas, Hanukkah and Kwanzaa, you’ll need a collection of cocktails to wow your guests and family members through the New Year. This winter, swap your go-to holiday bubbly for these festive coconut cocktails. (Sprouts Coconut Water’s magical ability to cure a hangover or a headache of any kind is also a serious bonus.) Cheers! Rim a martini glass with coarse sugar crystals. Place frozen cranberries in the bottom of the martini glass. Combine all ingredients in a shaker and shake with cubed ice. Strain liquid into glass. Sip and repeat. Fill a Collins glass with 2–3 ice cubes, add rum and coconut water to taste. Stir and serve. Place sugar cube in the bottom of a low-ball, add bitters and coconut water then muddle until sugar dissolves. Add gin, stir and fill with ice. Garnish with a lemon twist. Just shake and serve. If you’re feeling extra spirited, add a little more honey. Muddle lime juice, sugar and mint leaves in a tall Collins glass. Fill with ice, then add rum and coconut water. Enjoy! Alcohol not available in all stores. Must be 21 and older to drink. Please drink responsibly. From a previous issue of Sprouts Farmers Market’s monthly e-newsletter. Hungry? Sign up. Still searching for a last minute Father’s Day gift? Check out these DIY gift baskets your dad will love! Father’s Day is coming up fast, and you may still be looking for the perfect gift for dad. A gift basket personalized just for him is a great, practical gift any dad would be excited to receive. Get some inspiration from these easy, DIY gift basket ideas created by our friends at Fresh Mommy Blog; Food, Pleasure & Health; and Root + Revel! While dads might not purchase pampering items for themselves, it doesn’t mean they won’t enjoy a manly pampering gift basket, or a “man-pering” basket! Impress dad with natural products that smell incredible and give him the gift of taking his morning routine up to the next level. Start with a color theme! Choosing a color theme really completes the overall look of the gift. While browsing the bath and personal care aisles of Sprouts, the masculine, neutral color theme of black and brown popped, not only because so many of the men’s products fell into this color range, but I truly loved the packaging and the scents. Gather any items that would make dad feel special, and don’t forget the little touches that he might not purchase for himself. A cologne is a top gift for dads, as well as shaving products. Add some soap and deodorant, as well as a body scrubber, to complete his pampering routine. Next, it’s time to add a few extra treats. I stuck with a masculine theme, and our color scheme as well, and went for beef jerky. Don’t forget something to drink! What does the dad in your life love to drink? You could find a good beer, and I love that Sprouts stocks their beer section with local brews, so there’s always something new to discover. Is dad a coffee drinker? There are some amazing cold brew available, too. Whatever you choose, try and stick with the color theme. Choose an unexpected container to use as a gift basket! A tool box or wooden tool chest, a cooler or an ice bucket… the list goes on and on. A great container is like a gift in itself. Once you’ve settled on a container, load it up with the goods and some shredded paper, which helps with the natural masculine feel, keeping in mind height and placement. Give dad his gift and watch his face light up! Surprise your dad with a gift basket filled with essentials for both indoor and outdoor grilling. Gather all the supplies from your favorite craft store such as basket, galvanized tub, cooler, riser, tissue paper or fabric for décor. Purchase all the groceries including produce, meat, condiments and personal items from your local Sprouts. Arrange the non-perishable ingredients – think about color combination and height to make it visually appealing. Cover with cellophane bag, bows or other decorations as desired. Add ice to the cooler and pack it with perishable items like produce, raw meat, etc. This Father’s Day, instead of picking just one gift for your mindful man, how about putting together a fun collection of delicious, yet healthy, foods and practical personal care products that he is bound to love? Rather than using a girly gift basket that the Father in your life will likely toss or forget about entirely, wrap all these healthy goodies up in something they’ll actually use. I opted for a veggie grill wok because what dad doesn’t love to grill? Gift and watch dad enjoy all his goodies! Pick: Look for firm melons with a sweet fragrance as a sign that it’s ready to eat. Prep: Perfect for adding to fruit salads or drinks. Tip: Tastes similar to cantaloupe but with a distinct sweetness. Pick: Look for melons with yellow coloring and a slightly soft stem end. Prep: High in vitamin C, these are great for juicing. Tip: Also known as “muskmelons”. Pick: Choose melons that are firm with a sweet fragrance. Prep: Sprinkle ginger, salt or a squeeze of lemon on this fruit for a delicious snack. Tip: Its juicy, creamy-green flesh is known for its sweet taste. Pick: Look for firm melons with a sweet fragrance and a smooth, waxy surface. Prep: Use in salsas, smoothies and sorbets for an added refreshing and fruity flavor. Tip: Keep at room temperature one to two days before serving for a juicier melon. Pick: The deeper the orange color, the higher the sugar content. Prep: Pair with ginger for a refreshing snack. Tip: Similar to a cantaloupe on the outside but like a honeydew on the inside. Pick: Known for its floral and sweet aroma. Prep: Try pairing with cucumber and mint. Tip: A good source of vitamins A and C.
Pick: Choose firm fruit heavy for its size, yielding slightly under pressure. Prep: When the peel is smooth and the rind is a light cream color, it’s considered mature and ready to enjoy! Tip: A wonderful addition to breakfast or salads. Pick: Once ripe, it’s possible to hear the seeds rattle inside. Prep: Perfect to add to fruit salads or drinks. Tip: Its name is inspired by its gold shell. Pick: Ready to be enjoyed when the skin is slightly waxy and the color is yellow with an orange tinge. Prep: Eat as-is or include in a fruit salad. Tip: Also known as “temptation melons,” they share a taste of both honeydew and cantaloupe. Pick: Avoid melons that are too firm, too soft or have any part of the stem remaining at the tip. Prep: Enjoy as-is or include in refreshing summertime smoothies or sorbets. Tip: Expect a sweet-tart flavor with a hint of juiciness. Pick: Choose firm melons with a sweet fragrance. Prep: Great as-is or in desserts. Tip: Name inspired by its availability in winter months. 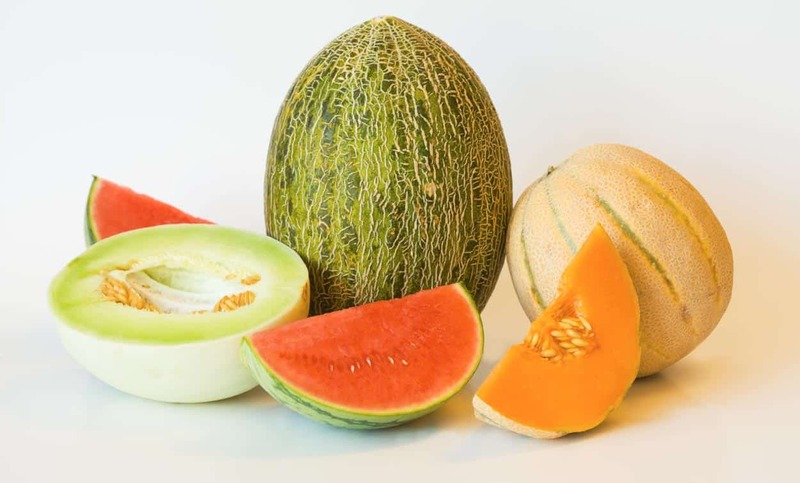 Pick: A ripe melon should be firm, heavy and bruise-free. Prep: Enjoy raw, in fruit salads or in fruit platters. Tip: A good source of vitamin A, vitamin C and lycopene. Pick: Select a melon heavy for its size with a deep-pitched tone when thumped. Prep: Enjoy raw, in fruit salads or fruit platters. Tip: Despite the name, all seedless watermelon contain white seeds as well as an occasional black seed. Pick: Choose a melon that is heavy for its size and bruise-free. Prep: Its small size is perfect to bring along to a picnic. Tip: Sweet, crisp and juicy, these melons contain about 88% water and are a hydrating snack. Need a last minute Mother’s Day gift? Look no further than these DIY gift baskets your mom will love! Mother’s Day is just around the corner and you may be rushing to find the perfect gift for mom. A gift basket made by you is a thoughtful, practical and personalized gift that any mother in your life will cherish. Check out these easy, DIY gift basket ideas created by our friends at Fresh Mommy Blog; Food, Pleasure & Health; and One Lovely Life! If anyone needs a little pampering in their lives, it’s the mamas of the world! Give her the gift she may not give herself – everything she needs for an evening of relaxation and pampering. Start with a color theme! While browsing the bath and beauty aisles of Sprouts, I landed on the theme of blush and vanilla. The Nubian Heritage bottles were pretty, and the perfect start to our themed basket. The product also smelled fantastic! Gather any items that would make bath-time a pampering and relaxing experience. In keeping with the vanilla theme, the Tru Mélange candle fit right in. The pumice stone and brush combo matched, and so did the oatmeal soap. Next, it was time to add a few extra treats. Chocolates are definitely part of a pampering experience, and I picked up a couple containers of various chocolates to put in mason jars to add to the look and feel of the gift basket. You could use goodie bags, add ribbon, tags, etc. Don’t forget something to drink! Mom’s favorite tea, coffee or wine makes a great pairing for a night of pampering. Rosé is not only a top choice, it’s also a beautiful one! This bottle of Gérard Bertrand Coté des Roses was stunning and I knew the bottle could even be reused later. Grab a beautiful bouquet to top off the basket, and you’re ready to go! Using towels, wash cloths or even a robe, begin to build the ultimate pampering basket by layering the items so each is visible and compliments the others. Each item in this basket is hand-picked for moms who are adventurous cooks and are ready for more finesse in the kitchen. Optional: Bows, cellophane bag, ribbons, etc. Gather all of the supplies from your favorite craft store and ingredients from Sprouts. Lay the basket flat on the floor and put empty cardboard box or riser inside for height. Arrange the ingredients; think about color combination and height to make it visually appealing. Cover with cellphone bag, bows or other decorations as desired. This gorgeous basket is full of natural beauty favorites—from makeup to self-care and more. This is the perfect gift for the beauty lover in your life. Assemble all items in your favorite basket or bag. Give along with fresh flowers. Add all ingredients, except tortilla chips, to a food processor and pulse until desired consistency is reached. Serve with Sprouts Yellow Corn Tortilla Chips and enjoy. Add all ingredients, except tortilla chips, into a food processor and pulse until desired consistency. Serve with Sprouts White Corn Tortilla Chips and enjoy. In a mortar or large bowl, mash avocado using pestle or fork. Stir in the rest of the ingredients, except for the chips. Serve with Sprouts Ancient Grain Tortilla Chips and enjoy. Stir in the rest of the ingredients, except for the chips.Serve with Sprouts Plantain Chips and enjoy. Serve with Sprouts Blue Corn Tortilla Chips and enjoy. If you’re looking for an easy-drinking summer wine, rosé is a crisp, lean, delicious and refreshing option that is easy to shop. Made all around the world, rosé is produced from a variety of red grapes with minimal contact from their grape skins, which results in the soft color. Darker rosé may be slightly richer and can sometimes be a bit fruitier than the paler options, which may suggest floral notes. Find one from the U.S., South America or Australia. They’re fruitier, sweeter and usually have a lower alcohol content. Italy, Spain and France will typically provide a crisp and tart wine with an ABV above 11%. Offering flavors of berries, cherry, apple and peach. Pairs perfectly with Mexican dishes and spicy curry. Light and refreshing, these styles feature flavors of summer berries and are perfect paired with appetizers, bbq and pizza. Full flavored with notes of cherry, vanilla, strawberry and even a bit of pepper. Grilled meats, salmon and fresh veggies will make the complete experience for this style. In a small saucepan, bring water and lavender to a boil. Reduce heat and simmer for about 10 minutes, stirring occasionally. Let cool and steep for about 15 minutes. Pour mixture through a strainer, pressing on lavender to get all the syrup out. Fill a large pitcher with ice. Pour in lavender syrup, lemonade and rosé. Add lemon slices in to the pitcher and stir. Pour into ice-filled glasses and garnish with lavender sprigs. Recycling is what happens when you put things in the recycle bin at home or work. These items (paper, aluminum cans, plastic bottles, etc.) are broken down and recycled into other similar-type products. Upcycling though, is taking something you might put in the recycle bin and turning it into something different—that generally is of greater value than the original object. These DIY upcycled terrariums definitely add value! Begin by removing labels from empty glass jars: Soak them in warm water with equal parts of dish soap and vinegar. Carefully peel off the label and scrub the outside of the jar removing any label residue. Once potting soil has been added, use the long brush to clean the inside edges of the glass, removing soil from the sides of the bottle. This will help ensure that the plant remains clean when added to the jar. Carefully add your fern or plant to the jar. Using chopsticks, maneuver the plant so that its roots rest on the bottom of the jar—in the space on the opposite side of the soil. Once plant is placed, carefully fill the gap at the bottom with the soil so that the roots of the plant are covered and the plant sits up once you bring the bottle to a fully upright position again. Again, using the long brush, brush the sides of the glass bottle cleaning the dirt from the edges. Finally, decorate the jar with twine and a tag then place terrarium in an area with sufficient sunlight but avoid direct sun. Add a small amount of water when soil is try but be sure not to over water the plant.